Hi everyone! Hope you're having a really lovely weekend. 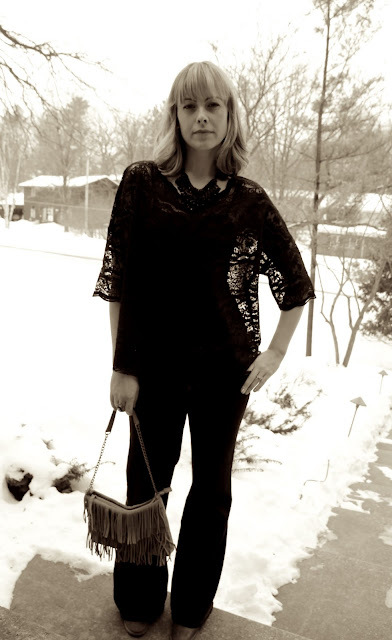 Today I'm wearing a favorite black lace top by Free People, a store I love yet dare not shop in too often. I was able to rip this one of the hanger during a sale, hopefully more elegantly than that (though I felt excited enough about it!). Anyway, it's uber comfy as it's an oversized fit that can go both ways, either really chic or really sloppy. You be the judge today. I'm off to dinner with the girls tonight, so I added a sparkly something to my décolletage and pink lips to match my pink belt. It's the small things making me happy ;). I thought this little fringed bag would be perfect for my phone and gloss tonight, sharing that Free People boho appeal I love so much.